As two lethal elemental gods set out to destroy Mytica, sworn enemies must become allies in the final fight to save the kingdoms. Jonas continues to willfully defy his destiny, but the consequences of plotting his own course are drastic. As the fight for Mytica rages on, he must decide just how much more he’s willing to sacrifice. Lucia knows there’s something special about her daughter and she’ll do anything to protect her, even if that means facing Kyan alone. Amara is called back home to Kraeshia. Grandma Cortas has her own plans for Mytica’s future. She promises Amara power, revenge, and dominance if she agrees to be part of her scheme. Magnus and Cleo’s love will be put to the ultimate test. Dark magic is causing widespread destruction throughout the kingdom. Enemies across the sea are advancing. And unrest is stirring throughout the land. Is their love strong enough to withstand the outside forces tearing them apart? 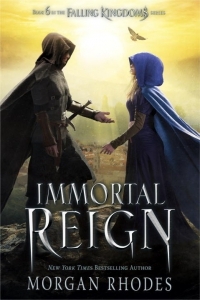 The Falling Kingdoms series by New York Times bestselling author Morgan Rhodes comes to a thrilling conclusion.